Situated on Victoria’s southern coast, Warrnambool grew quickly on the back of both pastoral settlement and gold. Exposed to strong south-easterly winds, its port, unlike Geelong’s, didn’t flourish, whereas the railway connection from 1890 did. It retains fine civic buildings and churches from the late nineteenth century, which mercifully have not been subject to wholesale redevelopment. Its industrial base developed on butter and cheese factories, augmented in 1947 by a Fletcher Jones trousers factory. The factory gardens still greet travellers entering Warrnambool from Melbourne, along the Princes Highway, but the factory itself fell victim to the reduction in tariffs on imported textiles, and increasing completion from Asia, and closed in 2005. Warrnambool is the fifth largest provincial city in Victoria. It has about one third of Ballarat’s population and about one fifth of Geelong’s population. Situated in western Victoria, Warrnambool is a coastal city on the Princes Highway about midway between Cape Otway and the South Australian border. Warrnambool is between the Merri and Hopkins Rivers, the latter emptying into Lady or Warrnambool Bay. The bay historically provided a harbour facility that was the closest one west of Cape Otway. Unlike the harbour towns of Port Fairy and Portland which were settled by sea crossings from Tasmania, Warrnambool was settled from the landwards direction (despite the need for river crossings either side). Warrnambool’s name is thought to have been derived from an Aboriginal word with several attributed meanings, including place of plenty, running swamps and a growing tree. (A large swamp south of the town has been made into a lake and reserve). Pastoral settlement in the Warrnambool area began with the Watson brothers on the Hopkins River and the Allan brothers at Allansford, both in 1839. By 1845 Lady Bay was viewed as a harbour outlet for agricultural produce. A site for a town was surveyed and town allotments were sold in 1847. Town settlement was relatively quick, considering that it was before the gold rushes inland: by 1850 there were a school, a community chapel, two hotels, a flour mill, blacksmiths and several stores. A bridge was built over the Merri River at Woodford (1848) and there was a ford on the Hopkins River at Allansford for transporting produce. There was also a punt on the Merri River (1848) at Dennington. A jetty was built at Lady Bay, but the harbour was troubled by south-easterly weather, and a breakwater met with indifferent results and contributed to silting of the bay. Despite prodigious expenditure on port improvements, road and rail were ultimately the better means of transport, The port was closed in 1942. Supply of food to gold towns stimulated agricultural growth during the 1850s and brought much useful work from a Road Board (1854). Urban Warrnambool was made a municipality on 7 December 1855 and a borough on 1 October 1863. The surrounding Road District became a shire also in 1863. 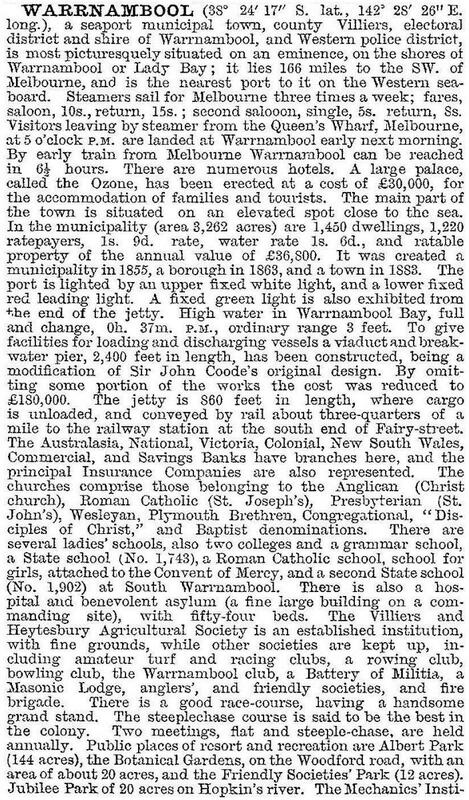 In 1865 Bailliere’s Victorian gazetteer recorded Warrnambool as having flour mills, tanneries and sawmills, a customs house and an immigration office, two newspapers, several banks and insurance agencies, and six hotels. Until the extension of the railway from Terang to Warrnambool in 1890 the port was relied on for the carriage of local produce – wool, wheat and potatoes. Coastal shipping continued beyond the 1900s, when rail transport became more common. 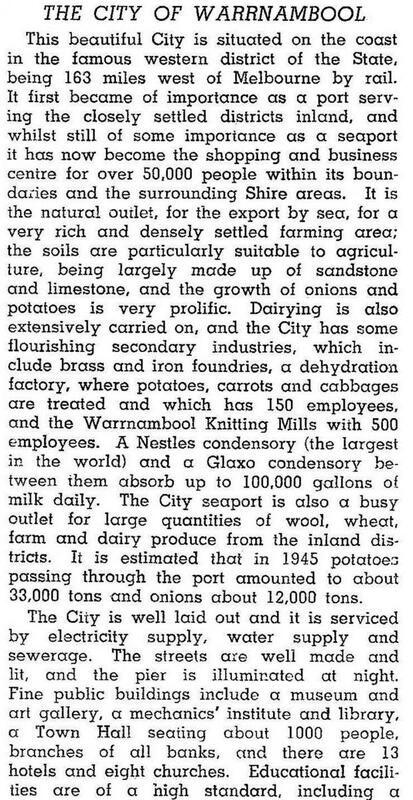 By 1890 dairying emerged as an important industry. The Warrnambool butter and cheese factory was opened by the Chamber of Commerce at Allansford in 1888 and three others were opened around Warrnambool by 1890, including one at Dennington, immediately to the west on the Merri River. There was something of a building boom during the late 1880s, culminating with the railway station and the breakwater (1890), an elaborate Ozone Coffee Palace (1890) and a new town hall (1891). The nineties came to an apex with the holding of the Warrnambool Exhibition of Arts and Manufacturers in 1896-97. A minor blemish was the unhealthy swamp south of the township. Next to the swamp was Flagstaff Hill, with gun emplacements (1887) for coastal defences. An important industry which had to be omitted from this description was the Warrnambool Woollen Mill (1874), which was burnt down in 1882. The Warrnambool Chamber of Commerce fostered its re-opening in 1910. It traded successfully and opened annex factories in Port Fairy and Warrnambool, employing over 700 workers during World War II. Production was continued until takeovers by Dunlop (1968) and Onkaparinga (1982). The mill buildings were acquired by the City Council in 1994. At Dennington, the Farnham Cream and Butter Company was established in 1889. It was acquired by Nestle and Anglo-Swiss Condensed Milk Company in 1909. Warrnambool thus had three major factories by 1910, giving it a strong industrial base. A show piece fourth factory was the Fletcher Jones trouser tailoring (1947), later to be landscaped as a tourist attraction. The garden area was a former quarry, and greeted travellers entering Warrnambool from Melbourne, along the Princes Highway. The site was sold to a developer in 2014. Until the years after World War II, Warrnambool’s retailing was notable for long standing large family stores and emporia. In the 1970s several sold out to national chains and most were gone by the next decade. The traditional shopping strip in Liebig Street was challenged by free standing centres to the west (1981) and east (1986). The Chambers of Commerce ceased. 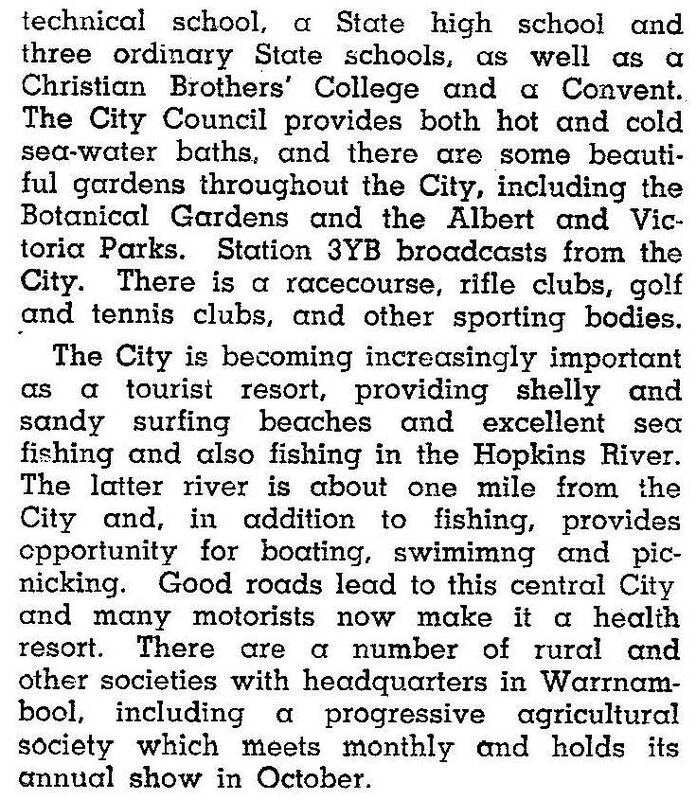 As tariffs on clothing and textiles were reduced during the 1970s and 1980s, Warrnambool reassessed its tourism potential, which it had promoted since the previous century. In 1975 Flagstaff Hill was opened, a maritime museum complex around two lighthouses and nineteenth century defensive gun fortifications. It has a longer tourist season than the beaches which are exposed to southerly weather. When the weather is too cold whale watching occurs during June to September. There are also annual sporting events, the Melbourne to Warrnambool bicycle race (1895) and the Grand Annual Steeplechase at the racecourse, although the latter has been plagued by horses being injured and put down. Warrnambool has grown as provider of tertiary services to the Western District. Between 1971 and 1981 employment in community services and finance increased by over 50%, occupying 29% of the workforce. During that period, employment in manufacturing fell from 24% to 19% of the workforce. Retailing and wholesaling even fell by about the same amounts. In 1996 manufacturing employment was 11.5% of Warrnambool’s full and part time workforce, retail employment was 21% and employment in education, health and community services was 22%. The changes which began in the 1970s corresponded with a slowdown in Warrnambool’s spectacular postwar growth – the population figures were 9993 (1947), 18,684 (1971) and 23,946 (1991). The early years of growth may have caused complacency, dissuading Warrnambool from embarking on projects that became overdue: town planning was not started until 1970, a performing arts centre tacked onto the town hall was completed in 1983, and the city’s art collection, begun in 1886 in the mechanics’ institute, was mothballed for decades until a gallery was built in 1986. Secondary education had got off to a good start with an agricultural high school (1907) and a technical school (1913). Advancement to an institute of advanced education in new premises 5 km east of Warrnambool occurred in 1969, and incorporation with Deakin University occurred about 20 years later. The establishment of the Flagstaff Hill maritime complex was a relatively early initiative, coming nine years after Australia’s first outdoor museum at Swan Hill (1966) and five years after Ballarat’s Sovereign Hill (1970). Swampy Lake Pertobe immediately west of Flagstaff was drained and landscaped by 1980. Warrnambool is well provided with parks and gardens, with botanic gardens (1869) north of the city centre and Victoria Park and Albert Park flanking the city’s west and east. The racecourse adjoins Albert Park. The showgrounds, west of the city, is the venue for Warrnambool Agricultural Society which originated from the Villiers and Heytesbury Agricultural Association in 1855. Lake Pertobe leads down to the beach, the yacht club, the jetty and the breakwater. Merri River empties behind the breakwater, and the river’s western bank leads round to Thunder Point, where the westerly rollers crash ashore. Many of the fine civic buildings and churches of the nineteenth century are in the city centre, although only a few have formal heritage registration. Water related features have fared better, with a lighthouse, Proudfoot’s boathouse and the Hopkins River timber trestle bridge (1894) being on the Victorian Heritage Register. The botanic gardens are also registered, along with Fletcher Jones’ Pleasant Hill gardens and factory (1948-2005). Liebig Street, from the court house (Timor Street) to the Princes Highway, has numerous heritage commercial buildings. One of the cross streets, Koroit Street, has the Anglican church (1856, 1882) and the Uniting (Methodist, 1939) church. The latter stands out, with its modernist idiom. A grand Presbyterian church (1875) is across the Princes Highway in Spence Street, along with a smaller restrained Church of Christ (1884). Catholic churches (1856, 1872) are in Kepler Street. Health and education facilities are well represented including Warrnambool Base Hospital, St John of God Hospital, Lyndoch Day Hospital, Catholic primary and secondary schools, two State secondary colleges and the Deakin University campus. There are also numerous accommodation facilities, headed by over 20 motels. By 1995 Warrnambool had 1570 bed spaces and over 1300 sites in caravan parks and camping grounds. In 1992 Warrnambool had 9700 square metres of retail space, about 40% of all the Western District west of Colac. The proportion of bed spaces was about the same. 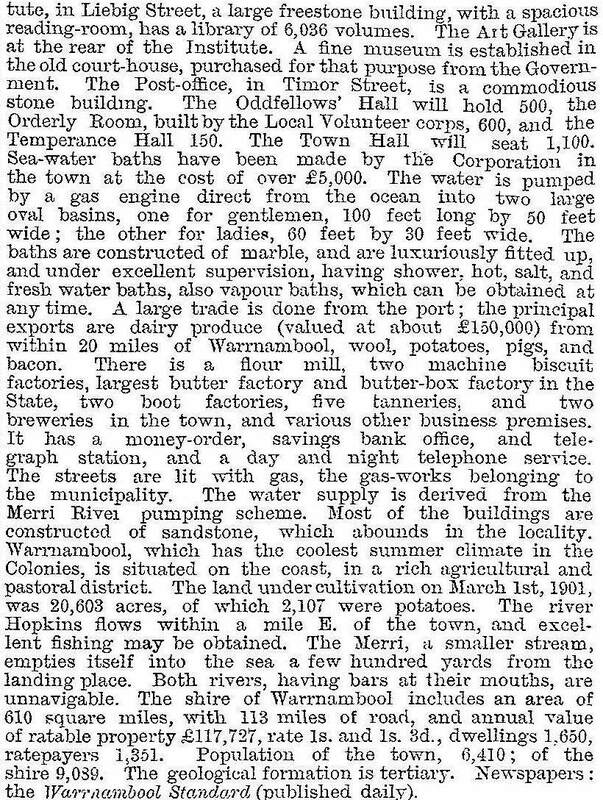 Warrnambool’s municipal progress was proclamation as a town on 2 February 1883 and proclamation as a city on 8 April 1918. On 23 September 1994, it was enlarged mainly northwards and eastwards from 34 sq km to 103 sq km. The main urban addition was Allansford.